I had some fun this weekend. My snowflake tree is in need a facelift for Valentine's Day, so I spent Sunday afternoon making some heart ornaments. The best thing about it was the fact that I sat at the kitchen table with Mr. One (My 8-year-old for those of you who have no idea who I'm talking about) who was working on an altered composition book. Yes, Mr. One is an artist. He was busy cutting and pasting Star Wars Lego figures to the cover. He has a sense of humor, that kid. When he showed me his finished product, he had given light sabers to a Spongebob character, and Patrick too. I just loved that we could sit there together and create. So. much. fun. Wendy, the hearts are so cute and vintagy! Can't wait to see the tree!! You are so smart to start early. Love these!!! They are very cute! Love the colors and how you put the patterns on too! So about the hearts, when can I come pick them up? These are really cute! I was just at my favorite scrap book store cutting out hearts of chipboard and paper to make some decorations. Looking forward to seeing your tree! Thanks for giving me the link for the star! How Cute Are These????? I can hardly wait to see them on the tree. And for the No. 6 pillow below... green with envy... in the compliment sort of way. Hee-hee! Love the glittery hearts! What a pretty way to liven up cold winter days! Cute! Cute! Cute! I love those! So creative! Can't wait to see the finished product. I love that glitter too. Those are lovely! You are so talented. So cute. The best part is that your little boy is sitting with you and doing his thing too. Those are so cute! I love the crowns on them. Ohhh! So pretty! Can't wait to see the tree! Those are the CUTEST!!! I enlarged them and you can see the glitter very well. 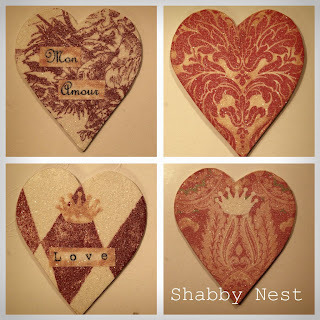 I can't wait to see what else you make and your finished Valentine tree. How did you get the pattern on the hearts? DId you draw that too? Love the vintage look to those hearts. I can't wait to see the finished tree! This looks great and I want to make some! I have a ton of Valentine fabric and scrapbook paper...oh the ideas are whirling in my head. I love Valentines but not sure how to decorate so it doesn't look cheesy. I really like these hearts..they are perfect. Thanks! EEE GADS!!! I am so inspired. I guess that it is time for me to get crafty again. These are sooo adorable on so many levels. As for your mr. 1 and my mr. 1,...I sure wish that they could spend time together. They sound so alike. (I guess that is what we get for having everything except for an ocean between us. :( ) I am thrilled that yours if full of such artistic energy!!! LoVe!!! so fun. You could totally sell those! you write & make it sound so easy! they are all very pretty. would love to see them on the tree. Now these are the kind of V. hearts I want to make! Gorgeous! I want to know more about the distressing ink and glitter. What kind of glitter? Doesn't the yellow lighting just help with the vintage look? Very astute of you to consider that before photographing... truly genius! Okay, I'll do a kids storage blog for tomorrow... gotta look me up some great ideas! This is such a great idea! Great job.